AREDIUS (YRIEIX, YRIEZ), Abbot of the Abbey of St. Martial, in Limoges, and chancellor to Theudebert II, King of Austrasia. St. Aredius was the founder of a monastery south of Limoges that is now called Saint-Yrieix, and is the namesake for the various French towns and villages called St. Yrieix. St. Aredius reposed 591. EBBA the ELDER, St. Ebba the Elder was a sister of SS. Oswald (5th August) and Oswin (20th August) and received monastic tonsure at Lindisfarne. She went on to become the founding Abbess of the double monastery at Coldingham in Scotland. St. Ebba maintained friendships with SS. Cuthbert (20th March) and Adamnán of Iona (23rd September), and was the spiritual mother of St. Etheldreda (23rd June). St. Ebba reposed 683. EUSEBIUS, PONTIAN, VINCENT, and PEREGRINUS, martyrs at Rome under Commodus (circa 192) whose relics were translated to France in the ninth century. GENESIUS (GENÈS) of ARLES, a notary in Arles, who, when an imperial decree ordering the persecution of Christians was read in his presence, he declared himself to be a Christian and fled. He was captured and martyred (circa 303). GENESIUS the ACTOR, an actor who, after having performed several plays mocking Christianity, had a conversion experience, proclaimed his faith in Christ. St. Genesius, even when facing torture and death, refused to renounce his faith, and was martyred. The exact date is uncertain, though it is said to have been during the reign of Diocletian (284 - 305). GERUNTIUS of ITALICA, (First Century), a missionary in Spain during the first century who is believed to have served as Bishop of Talco (Seville), and been martyred. GREGORY of UTRECHT, a disciple of St. Boniface (5th June). Following the martyrdom of St. Boniface, St. Gregory assumed leadership of the Church of Utrecht. He has always been styled Bishop of Utrecht, though it is unclear whether he received Episcopal consecration. St. Gregory reposed 781. HUNEGUND, having been betrothed against her will, whilst on a pilgrimage to Rome, with her bridegroom, she was released from her marital vows and received monastic tonsure from Pope St. Vitalian (27th January). After returning to France she entered the abbey at Homblieres where she spent the rest of her life, reposing 690. MAGINUS (MAXIMUS), a hermit, and wonder-worker, in the mountains near Tarragonia in Spain. He was beheaded circa 304. The name Magi, which is common is Tarragonia, maybe derived from his name. MARCIAN of SAIGNON, a native of Saignon in the department of Vaucluse in southern France. St. Marcian was the founding abbot of the Abbey of St. Eusebius, Saignon, in the Diocese of Apt, and reposed 485. 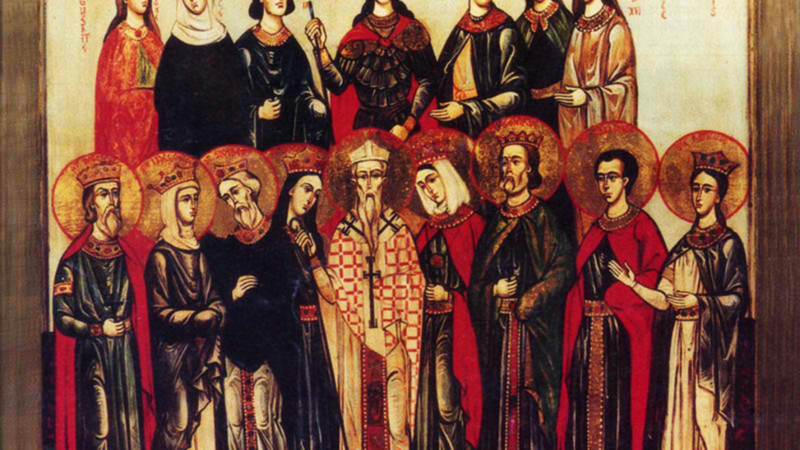 NEMESIUS and LUCILLA, Nemesius, a deacon, and Lucilla, his daughter, are numbered amongst those Christians martyred in Rome under the Emperor Valerian (254 - 260). PATRICIA, a noblewoman from Constantinople, possibly related to the imperial family, who fled to Rome in order to escape marriage. Whilst in Rome she received monastic tonsure. returning to Constantinople, she renounced any claim to the imperial crown, and distributed her wealth to the poor. St. Patricia then set out on a pilgrimage to Jerusalem, however her ship encountered a storm and she was shipwrecked on the shores of Naples, shortly afterwards she succumbed to disease and reposed circa 665. St. Patricia is one of the patron-saints of Naples. WANNUS (GUARINUS, WARREN), (Seventh Century), the son of St. Sigrada (8th August), and brother St. Leodegarius (2nd October). St. Wannus was martyred by stoning under Ebroin, the Frankish mayor of the palace of Neustria, near Arras, France, 676.